Hey! I'm back! We you worried since it was so quiet around here last week? No worries, just lots of birthday sewing behind the scenes and winter break for the kiddo. Which amounted to her being home a whopping 8 extra hours and me being totally exhausted. It seems that now that I'm used to that little bit of precious time to myself it's a huge change when it's gone. Which is kind of making me dread "summer vacation" (kind of cracks me up for a two year old to have it but they do), but I'm sure we'll find our groove and be just fine. I made a couple of these wallets which are very cleverly designed by Sue Kim of ithinksew fame in her book Bags: The Modern Classics. I've bough several of her pdf patterns and her book is just as inspiring as all her other work. Worth purchasing if you like sewing bags. So these sewed up quite quickly and I was pleased with the wallets and the chance to use some cools buttons. I didn't love the elastic and how it was attached but Theresa suggested adding a fabric tab with a buttonhole in place of the elastic and I LOVE that idea for next time. The elastic closure works, it just seems kind of clunky. The inside pockets hold a LOT. Rooms for cards and cash - I prefer the longer wallets myself. So at least 8 cards and a long pockets for cash, receipts, what have you. So here's the part that made me stomp my foot and swear a bit (it was after you-know-who's bedtime). So then I thought about Rachel's zigzag method for quilt binding and I thought it might work better here too. And obviously it wasn't going to get a lot worse, so I ripped this out and sewed it back down with a zigzag stitch. SO much better. Not perfect but good enough to give as a gift at that point. So the zigzag saved the day! Happy birthday Melissa :-) And thanks Theresa for the suggested improvement for next time! 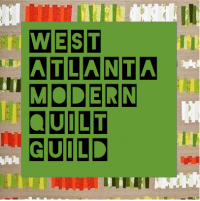 We had a lovely meeting of the Atlanta Modern Sewing Guild at Whipstitch on Saturday. Just a bunch of cool, crafty chicks hanging out and being sew-cial (BWHhaha). Blogging is a great way to connect with people but it's so nice to get together and hang out in real life. If you live in the Atlanta area and you want to join us just email me for the info!